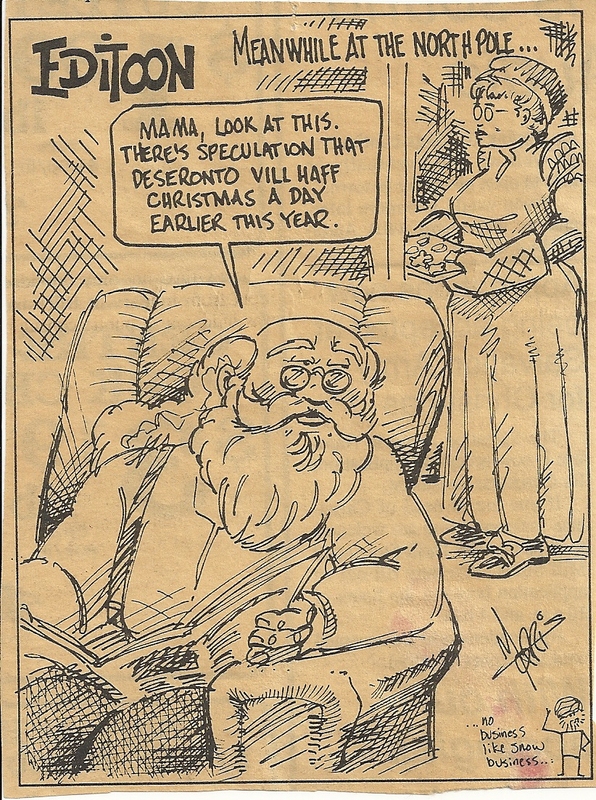 This festive cartoon came in today in a file of tourism-related flyers and correspondence from Deseronto’s Town Hall. It dates from late 1993 and is possibly from one of the Napanee newspapers. It’s rather puzzling though: does anyone know what had been celebrated a day earlier in Deseronto that year, to trigger this? UPDATE: Halloween fell on a Sunday in 1993, prompting discussion about celebrating it on the Saturday. Thanks to Gail and Dana for solving that mystery! Gail was thinking it could be Halloween. She remembers there being talk of changing Halloween because it fell on a Sunday in 1993. She doesn’t think they actually switched it, but the fact they were considering it may have resulted in some coverage from the local papers! Ah, that makes perfect sense. Yes, Halloween did fall on a Sunday that year. Thanks Dana, thanks Gail!